HotelClub Offers Stay at The Bayview Geographe Resort Busselton From �46, Australia. HotelClub Offers Stay at The Bayview Geographe Resort Busselton From �46, Australia. The Bayview Geographe Resort Busselton invites you to experience its indescribable natural beauty that makes it a destination in itself. Fully equipped with the latest state of the art equipment and a dedicated professional team, any business request will be met if not exceeded. Includes: Outdoor and indoor pool, spa, gym, tennis. Squash and volley ball courts. Childrens play area and facilities. Golf and much more. T&C: Booking & Staying Period: until 30th September, 2015. Book Now. HotelClub Offers Stay at West Side Inn Amsterdam From �63, Holland. HotelClub Offers Stay at West Side Inn Amsterdam From �63, Holland. Business and leisure travellers looking for value-for-money accommodations in the Netherlands capital city find ideal base at West Side Inn Amsterdam. Guests at this inviting Amsterdam hotel can check out the collections on exhibit at the vibrant Museum Quarter, step inside old De Oude Kerk, visit Royal Palace of Amsterdam and explore historic Begijnhof. Holidaymakers can take a breather at Vondelpark. World Trade Center Amsterdam and Amsterdam RAI Exhibition and Convention Centre are three kilometres away from the hotel. Includes: Spacious rooms in the property are well maintained. Each unit is equipped with telephone, TV, Wi Fi access, private bathroom and toiletries. T&C: Booking & Staying Period : 30 September 2015. HotelClub Offers stay at Generator Hostel London from �40. Generator Hostel London provides comfortable accommodation to cater for the needs of both business travellers and holidaymakers. Tourists cannot afford to miss a visit to British Museum that displays a wealth of British masterpieces. The Royal Opera House also adds up to the list of most visited tourist spots of the city, where guests can enjoy operas and royal ballet. Outdoor lovers can visit the nearby London Canal Museum, a famous waterways museum telling the story of canals, ice trade and ice cream. Travellers can pay a visit to Charles Dickens Museum, which houses rare editions of the authors work, explore Covent Garden or visit London Theatre to enjoy a day of music, opera and ballet. T&C: Booking & Staying Period : 30 September 2015. Book Now. HotelClub Offers stay at Westgate Las Vegas Resort & Casino from �20. Offering tasteful spaces and strategic location, Westgate Las Vegas Resort & Casino (formerly the LVH- Las Vegas Hotel Casino) makes for an ideal base for a fun-filled holiday in Las Vegas. Tourists at this sophisticated hotel find endless entertainment, shopping and dining options at famous Las Vegas Strip. Vacationers can also spend time at Adventuredome Theme Park or browse the stores at Fashion Show Mall and Crystals at City Center. Includes: The hotel has a spa, cardio room six tennis courts and poolside cabanas. Wifi , Pool and much more. T&C: Booking & Staying Period : 30 September 2015. Sydney Harbour Bridge Day Climb HotelClub From 180�!! Sydney Harbour Bridge Day Climb HotelClub From 180�!! One of the most popular tourist attractions in Australia, the Sydney Harbour Bridge Climb is an opportunity to have the world at your feet. Inclusions: Fee for the official climb - a guided journey led by a trained climb leader lasting 3.5 hours in groups not exceeding 14 people. Complimentary group photograph. Commemorative climber certificate. Phang Nga Sea Cave Canoe Tour From Phuket. Phang Nga Sea Cave Canoe Tour From Phuket. Pack your sense of adventure and set off on a magical day trip to explore the many wonders of spectacular Phang Nga Bay with HotelClub. Why book this tour: A thrilling sea canoe adventure in spectacular scenery. Perfect family day out in Phuket. Swim and sun bathe in a tropical paradise at Lawa Island. A delicious buffet lunch is included. Complimentary hotel pick up and drop off. Book Now. A Day at Lembongan Island Beach Club from Bali HotelClub. A Day at Lembongan Island Beach Club from Bali HotelClub. Lembongan island in is one of the most popular diving sites in Indonesia. Experience the unspoilt charms of a peaceful tropical island on this Beach Club cruise. Why book this tour: Enjoy a peaceful catamaran cruise to one of Indonesias best diving sites. Go diving or snorkeling and discover the amazing underwater world. Relax at a beautiful private beach club, soak up the sun and enjoy a delicious barbeque lunch at the pool side cabana. Book Now. Explore Dart River Safari: Jet Boat Ride. Explore Dart River Safari: Jet Boat Ride, Nature Walk & Lord of the Rings Locations with HotelClub. Why book this tour: Experience the longest jet boat ride in the Queenstown region. Walk through the World Heritage Site of Te Waihipounamu, unchanged for millions of years. Visit the Lord of the Rings locations. Pickup and drop off services for centrally located Queenstown hotels. Book Now. Diving at the Outer Barrier Reef From Cairns HotelClub. Diving at the Outer Barrier Reef From Cairns HotelClub. Sail to the Outer Barrier Reef, go diving and see the stunning beauty of the coral. Why book this tour: The cruise is conducted on a luxury reef craft and buffet lunch and afternoon tea will be provided. All equipment is included and the dives are led by expert instructors. Informative reef ecology presentation. Personal space is assured with guest numbers limited to 60, but seating provided for 120. Book Now. Hong Kong in a Nutshell HotelClub. Hong Kong in a Nutshell HotelClub. Take a tram ride to Victoria Peak, see the fishing village of Aberdeen and shop in Stanley Market. Tour Includes: Tour is led by an English speaking guide. Tour offers you the option of a Sampan Ride in Aberdeen Harbour. This tour features Repulse Bay, Stanley Market and a prestigious jewellery factory. Destination in a Nutshell products show you the very best of a city in just one day. Pick up and drop off is offered at a range of Hong Kong hotels and tour is conducted in an air conditioned vehicle. Book Now. Sydney Harbour Bridge Day Climb HotelClub. Sydney Harbour Bridge Day Climb HotelClub. One of the most popular tourist attractions in Australia, the Sydney Harbour Bridge Climb is an opportunity to have the world at your feet. Inclusions: Fee for the official climb - a guided journey led by a trained climb leader lasting 3.5 hours in groups not exceeding 14 people. Complimentary group photograph. Commemorative climber certificate. Book Now. Sydney Harbour Bridge Day Climb HotelClub. One of the most popular tourist attractions in Australia, the Sydney Harbour Bridge Climb is an opportunity to have the world at your feet. Inclusions:. Fee for the official climb - a guided journey led by a trained climb leader lasting 3.5 hours in groups not exceeding 14 people. Complimentary group photograph. Commemorative climber certificate. Book Now. New Lantau Island Tour in Hong Kong with HotelClub. New Lantau Island Tour in Hong Kong with HotelClub. Just a short ferry ride away from Hong Kong is Lantau Island featuring spectacular mountain walks, great beaches and the wonderful Giant Buddha. Why book this tour: Pick up and drop off is offered at a range of Hong Kong hotels and tour is conducted in an air conditioned vehicle. Take a ferry ride to the beautiful Lantau Island. Lunch is included in the Po Lin Monastery. Tour is led by an English speaking guide. Book Now. HotelClub Ocean Park Tour in Hong Kong. HotelClub Ocean Park Tour in Hong Kong. Treat your family to a day of fun and excitement at the Ocean Park in Hong Kong. Ocean Park is the one of the most spectacular oceanariums in the world with the largest marine theatre. Why book this tour: Easy to book - easy to cancel - easy to change. Book early and receive discounts. Price same or lower than local rates. Best hand picked operators. Book Now. Shenzhen Tour From Hong Kong with HoteClub. Shenzhen Tour From Hong Kong with HoteClub. Travel to mainland China to visit the dynamic new city of Shenzhen on this delightful full day tour. Why book this tour: Visit the dynamic new city of Shenzhen in mainland China. Be mesmerized by the beauty of one of the world's finest botanical gardens. See the incredible Terracotta Warriors exhibition. Delicious Chinese lunch included. Book Now. Kawarau River Rafting Tour from Queenstown. Kawarau River Rafting Tour from Queenstown. Expect joy, exhilaration and stupendous scenery when you join this exciting rafting adventure on the Kawarau River with HotelClub. Why book this tour: Raft the spectacular Kawarau River Gorge, graded 2 3. No prior experience required - ideal for first timers. Experience the unforgettable 400m long Dog Leg - NZ?s longest commercially rafted rapid. Wetsuits and safety equipment included. Hot shower and sauna facilities provided. Book Now. Milford Sound Coach Sightseeing Tour with HotelClub. Milford Sound Coach Sightseeing Tour with HotelClub. The journey to Milford from Te Anau and Queenstown is magnificent. The road to Milford Sound, through Fiordland National Park, offers exceptional viewing opportunities with dense rainforest, towering mountains, glacial lakes and (near Homer Tunnel) avalanche debris and alpine herb fields. Why book this tour: Explore the beauty of Mildford Sound and Fiordland National Park on this full day tour from Queenstown. Enjoy Cleddau Valley and a Milford Sound Red Boat Cruise. Dont miss the breathtaking Alpine views. Stunning scenery and plenty of photography opportunities. Hotel pickup and drop off facility. Book Now. Stay 2 And Get 3rd Night Free at Grand Hyatt Seoul. Stay 2 And Get 3rd Night Free at Grand Hyatt Seoul. Enjoy more than a free night with HotelClub when you stay at Grand Hyatt Seoul. T&C: Offer period: From now until june 30, 2015. Book Now. Explore Dart River Safari: Jet Boat Ride. Explore Dart River Safari: Jet Boat Ride, Nature Walk & Lord of the Rings Locations with HotelClub. Why book this tour: Experience the longest jet boat ride in the Queenstown region. Walk through the World Heritage Site of Te Waihipounamu, unchanged for millions of years. Visit the Lord of the Rings locations. Pickup and drop off services for centrally located Queenstown hotels. Explore Extraordinary Western Australia with Hotelclub. Explore Extraordinary Western Australia with Hotelclub. 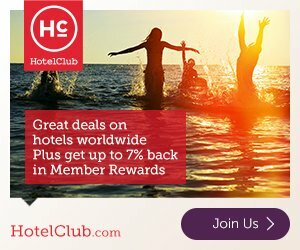 Save up to 30% off in selected hotels in Australia and live an extraordinary experience with HotelClub. T&C: Period of Booking and Stay: From now until 10/06/15. A Day at Lembongan Island Beach Club from Bali HotelClub. Lembongan island in is one of the most popular diving sites in Indonesia. Experience the unspoilt charms of a peaceful tropical island on this Beach Club cruise. Why book this tour: Enjoy a peaceful catamaran cruise to one of Indonesias best diving sites. Go diving or snorkeling and discover the amazing underwater world. Relax at a beautiful private beach club, soak up the sun and enjoy a delicious barbeque lunch at the pool side cabana. Hong Kong in a Nutshell HotelClub. Take a tram ride to Victoria Peak, see the fishing village of Aberdeen and shop in Stanley Market. Tour Includes: Tour is led by an English speaking guide. Tour offers you the option of a Sampan Ride in Aberdeen Harbour. This tour features Repulse Bay, Stanley Market and a prestigious jewellery factory. Destination in a Nutshell products show you the very best of a city in just one day. Pick up and drop off is offered at a range of Hong Kong hotels and tour is conducted in an air conditioned vehicle. New Lantau Island Tour in Hong Kong with HotelClub. Just a short ferry ride away from Hong Kong is Lantau Island featuring spectacular mountain walks, great beaches and the wonderful Giant Buddha. Why book this tour: Pick up and drop off is offered at a range of Hong Kong hotels and tour is conducted in an air conditioned vehicle. Take a ferry ride to the beautiful Lantau Island. Lunch is included in the Po Lin Monastery. Tour is led by an English speaking guide. Kawarau River Rafting Tour from Queenstown. Expect joy, exhilaration and stupendous scenery when you join this exciting rafting adventure on the Kawarau River with HotelClub. Why book this tour:. Raft the spectacular Kawarau River Gorge, graded 2 3. No prior experience required - ideal for first timers. Experience the unforgettable 400m long Dog Leg - NZ's longest commercially rafted rapid. Wetsuits and safety equipment included. Hot shower and sauna facilities provided. Doubtful Sound Overnight Cruises. Escape the hustle bustle of city life on this relaxing overnight cruise that takes you deep inside one of the most spectacular regions in New Zealand - Doubtful Sound with HotelClub. Why book this tour: Soak up the stunning surrounds of Doubtful Sound. Feel the awesome power of Nature here the remoteness, the wilderness and the peace. Enjoy a sumptuous three course buffet served with some of the region�s finest produce. Phang Nga Sea Cave Canoe Tour From Phuket. Pack your sense of adventure and set off on a magical day trip to explore the many wonders of spectacular Phang Nga Bay with HotelClub. Why book this tour: A thrilling sea canoe adventure in spectacular scenery. Perfect family day out in Phuket. Swim and sun bathe in a tropical paradise at Lawa Island. A delicious buffet lunch is included. Complimentary hotel pick up and drop off. Shenzhen Tour From Hong Kong with HoteClub. Travel to mainland China to visit the dynamic new city of Shenzhen on this delightful full day tour. Why book this tour: Visit the dynamic new city of Shenzhen in mainland China. Be mesmerized by the beauty of one of the world?s finest botanical gardens. See the incredible Terracotta Warriors exhibition. Delicious Chinese lunch included. HotelClub Ocean Park Tour in Hong Kong. Treat your family to a day of fun and excitement at the Ocean Park in Hong Kong. Ocean Park is the one of the most spectacular oceanariums in the world with the largest marine theatre. Why book this tour: Easy to book - easy to cancel - easy to change. Book early and receive discounts. Price same or lower than local rates. Best hand picked operators. Milford Sound Coach Sightseeing Tour with HotelClub. Why book this tour: Explore the beauty of Mildford Sound and Fiordland National Park on this full day tour from Queenstown. Enjoy Cleddau Valley and a Milford Sound Red Boat Cruise. Don't miss the breathtaking Alpine views. Stunning scenery and plenty of photography opportunities. Hotel pickup and drop off facility. Diving at the Outer Barrier Reef From Cairns HotelClub. Sail to the Outer Barrier Reef, go diving and see the stunning beauty of the coral. Why book this tour: The cruise is conducted on a luxury reef craft and buffet lunch and afternoon tea will be provided. All equipment is included and the dives are led by expert instructors. Informative reef ecology presentation. Personal space is assured with guest numbers limited to 60, but seating provided for 120. Sydney Harbour Bridge Day Climb HotelClub. One of the most popular tourist attractions in Australia, the Sydney Harbour Bridge Climb is an opportunity to have the world at your feet. Inclusions: Fee for the official climb - a guided journey led by a trained climb leader lasting 3.5 hours in groups not exceeding 14 people. Complimentary group photograph. Commemorative climber certificate.